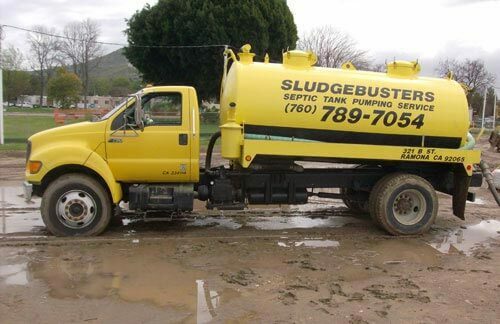 Sludgebusters is the acknowledged leader in providing San Diego County septic system cleaning services. We have been serving both residential and commercial customers throughout the San Diego County area since 1988, and our expert sanitation service professionals have performed 1000's of septic tank cleaning jobs throughout the greater San Diego County area. In addition, our highly skilled service and repair technicians utilize the most efficient, state-of-the-art septic tank cleaning system available in the sanitation industry today, and our fees for service are completely affordable. Following a regular maintenance schedule for cleaning out your septic tank system is critical. The typical life expectancy of a septic tank system is approximately 25 years. However, whether or not your septic system will actually last that long and function properly throughout the duration of its lifespan depends upon proper care. The pumping and cleaning process we provide is thoroughly comprehensive: We clean out both the primary and secondary tanks which comprise your septic system, following a process which meticulously eliminates both the solid and liquid waste from your septic tank. Moreover, no commercial or residential job is too small or too large for us, and our experienced, knowledgeable sanitation technicians will evaluate the condition of your septic system honestly, suggesting only the most cost-effective, truly essential maintenance services and repairs, while always keeping a view of the long-term health of your system in mind. We are licensed and fully insured, and offer same day pumping service to all of San Diego County. In addition, our emergency services are available 24 hours a day, 7 days a week to resolve any and all septic system problems that arise, including sewer main issues. We are certified by the National Association of Wastewater Transporters (NAWT), and our pumping trucks comply fully with all current environmental regulations, and are inspected annually by the San Diego Department of Environmental Health. Please give us a call today for any and all septic system issues or concerns that you may have. Does your business utilize a water jet cutter? As long as you are using your machine to cut phenolics, composites, stainless steel, aluminum, wood, plastics, or any other non- hazardous material, we will be happy to service your unit. Whether your machine is a 500 or a 5000 gallon unit, we are familiar with most types of models. Our technicians will take painstaking care in their cleaning process, because we fully appreciate that this equipment is vital to your operation. We have found that pumping out the reservoir of these machines is far more efficient than shoveling them out. In addition, our skilled professionals are able to service your machine in only a few hours time, minimizing the inconvenience your business will experience. Call us today to schedule a service appointment.